I don’t know about you, but I found it to be quite an interesting moment in the middle of the second quarter of yesterday’s game for the Pittsburgh Steelers when the coaching staff elected to remove Le’Veon Bell from the game, replacing him with Terrell Watson for the purpose of attempting a run on third and one. Bell over the course of his career has actually been among the most successful backs in this department in the league, among the highest performers in terms of gaining yards after contact and in gaining positive yardage on plays on which he was hit in the backfield. The All-Pro has been the one true all-purpose back in the league, which is why he was the only one in the NFL last year who actually hit the 90-percent usage mark in the games in which he played. In fact, he was the only running back who was particularly close to the mark, within five percentage points. The decision to take him out in favor of Watson made me go back to my charting notes to date from the season and look at how the offense has performed with Bell carrying the ball in short-yardage situations. The Steelers have run the ball six times in short-yardage situations—defined as needing three or fewer yards for a first down—through the first two weeks, with Bell getting each of those carries. He gained the needed yardage on four of the six carries, with only one of the two failures coming on third or fourth down, so it’s not as though he has not been successful. During the Bears game, the Steelers ran the ball in short-yardage situations twice prior to Watson being used. On their second offensive possession of the game, he was stopped after one yard on second and three, but earlier on the same drive on which he was replaced by Watson, he converted on second and one with a nine-yard run. There was, contextually, no obvious reason that would have prompted the coaching staff to check Bell out of the game at that time. On the previous play, he merely leaked out of the backfield as a potential outlet target on a deep pass into the end zone. Every indication simply points to the idea that the Steelers wanted to use Watson, the big back, during that scenario on third and one. It even prompted many to wonder if he would have been called upon at the goal line, but Bell got the carry on first and goal from the one and scored. Bell ultimately converted on two of his three short-yardage carries on the game, making him successful on six of nine conversion attempts on the season, and only one of the three failed conversions came on a ‘possession’ down. Will this isolated instance prove to be something worth monitoring going forward? 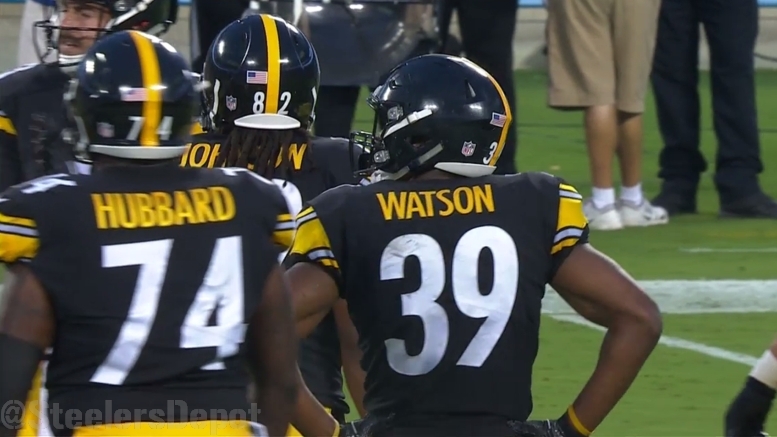 Watson initially made a name for himself during training camp with his success in short-yardage, but Bell is hard to take off the field.